The Paris Wife came out last year to much fanfare, yet I was hesitant when my book club chose it for our February read. I've never been much of a Hemingway fan, so I was pretty sure that I wouldn't enjoy reading about him. Good thing I gave the book a chance, because I was completely wrong. Plot: The Paris Wife is told from the point of view of Hadley, Ernest's first wife. They meet in Chicago in 1920 and quickly fall in love. After marrying, they're off to Paris where Ernest believes he can hob nob with the "it" literary crowd while advancing his career. After a while, Ernest and Hadley find themselves deeply engaged in Jazz Age Paris, friendly with some of the finest literary minds of the time. They travel Europe together as Ernest searches for the story that will make it big. However, as his career takes off, his home life suffers. Characters: Told from her vantage point, you can't help by love Hadley. Her voice is tender and real and she was by far my favorite character. As I thought about the book after I finished, I had trouble finding other favorites. There were lots of characters to be sure, but they all took a back seat to the central love story. In addition, many of the women in the book that Hadley considers friends were difficult to like. None were as real and genuine as Hadley, and I felt a niggling sense of distrust about each. Overall I enjoyed this book much more than expected. I struggled through Hemingway in high school and college, but this view of him before fame and fortune has given me a back story that makes me curious to give his novels another try. I love this book!!! One of my fav reads of 2011! I'm not sure this would make me go back and try Hemingway again but I'm definitely picking this book up. This sounds very intriguing. I read another review on NPR and it didn't seem like my cup of tea, but now I want to give a shot! I really liked this book, because Hemingway's posthumous memoir A Moveable Feast is one of my all time favorite books and always left me dying to know more about Hadley. The way he wrote about her gave the impression that she was his true soul mate through it all and he'd always regretted their seperation. So I was thrilled when this book came out, and it didn't disappoint. I am calling by from The February Book Blogger Hop. Thankyou for this review as this title has been on my wishlist for awhile and your review reaffirms that I really want to read this. Great book it explored the life of one of the great American Writers, Ernest Hemingway. 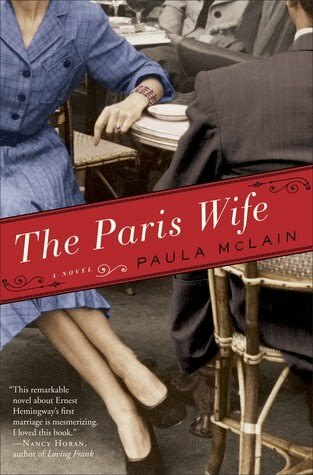 I enjoyed the book very much, Paula Mclain's. writing style made the book a great read.